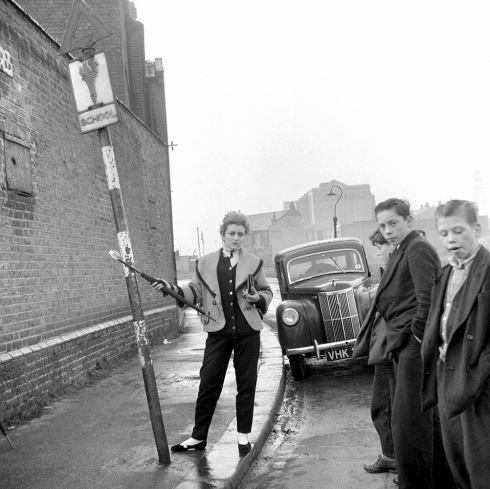 You might have heard of the Teddy Boys, a 1950s rebel youth subculture in Britain characterized by an unlikely style of dress inspired by Edwardian dandies fused with American rock’n roll. They formed gangs from East London to North Kensington and became high profile rebels in the media. 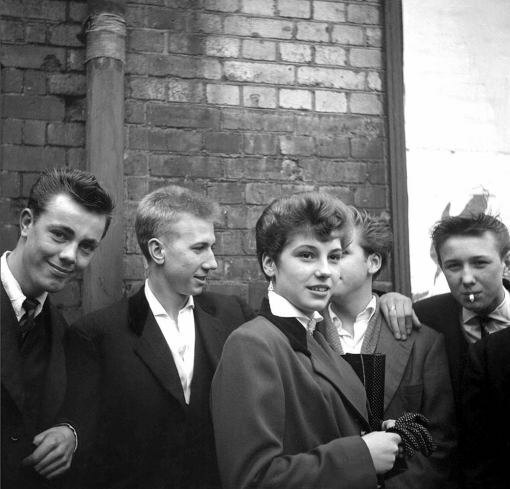 But an important sub-subculture of the Teddy Boys, an unlikely female element, has remained all but invisible from historical records. 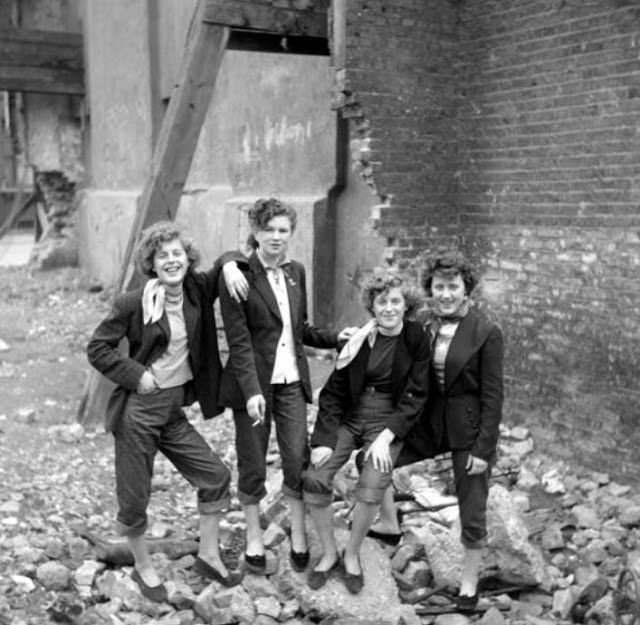 Meet The Teddy Girls. 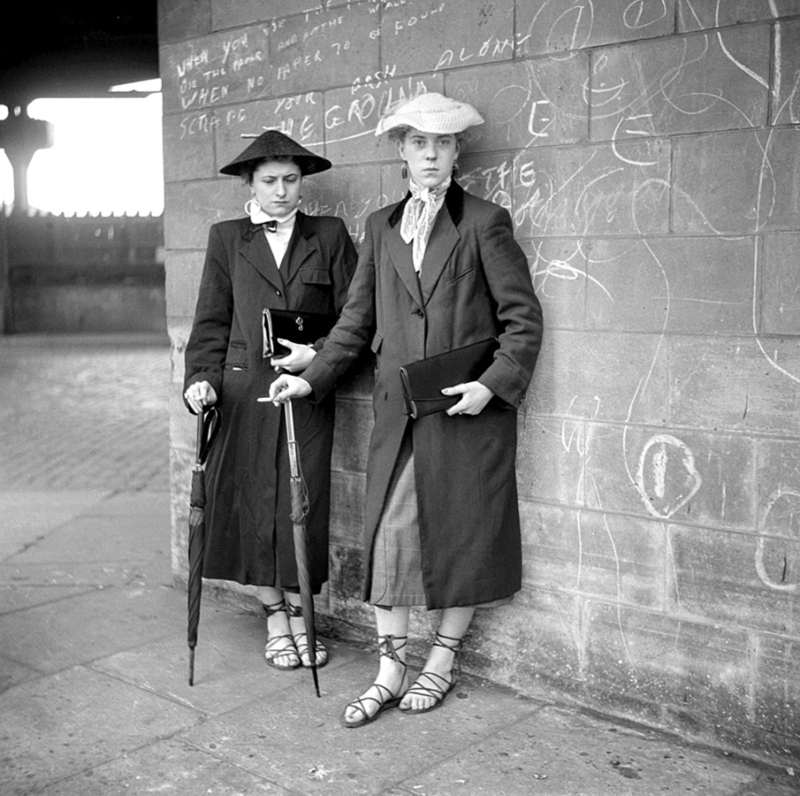 These are one of just a few known collections of documented photographs of the first British female youth culture ever to exist. 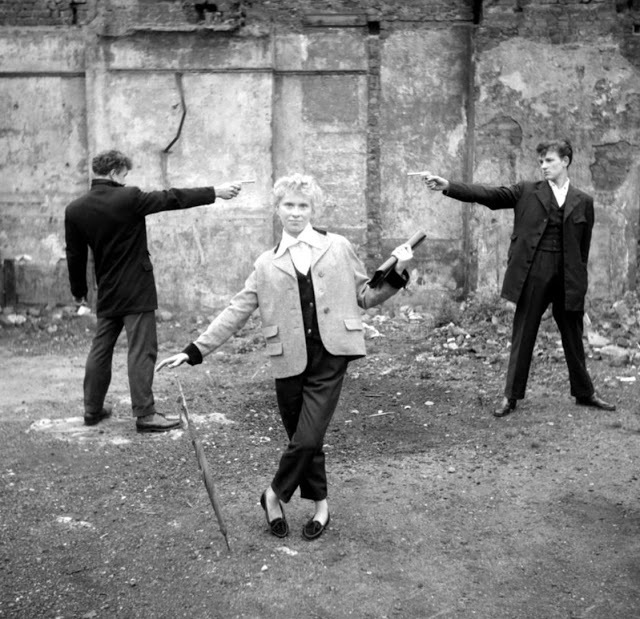 In 1955, freelance photographer Ken Russell was introduced Josie Buchan, a Teddy Girl who introduced him to some of her friends. 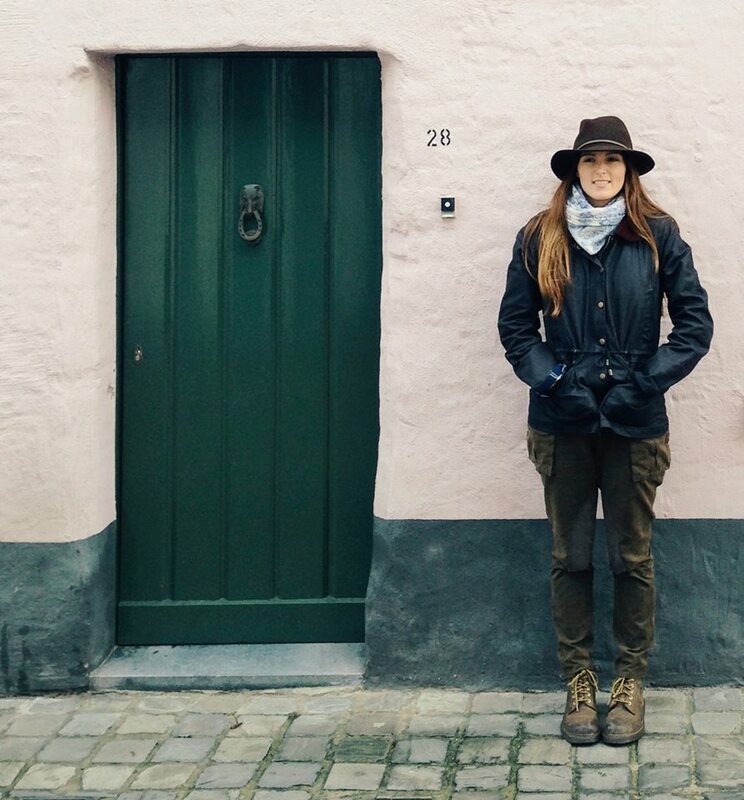 Russell photographed them and one other group in Notting Hill. 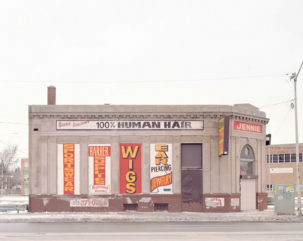 After his photographs were published in a small magazine in 1955, Russell’s photographs remained unseen for over half a century. He became a successful film director in the meantime. 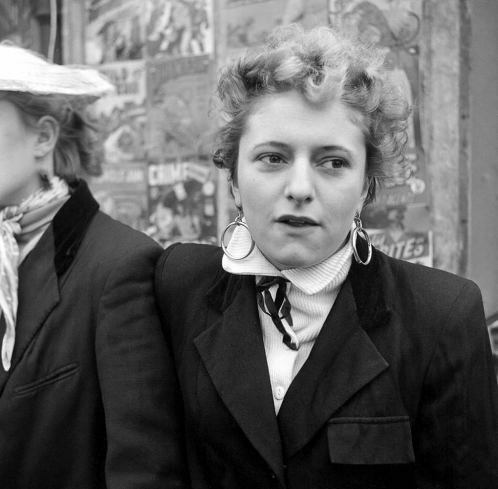 In 2005, his archive was rediscovered, and so were the Teddy Girls. 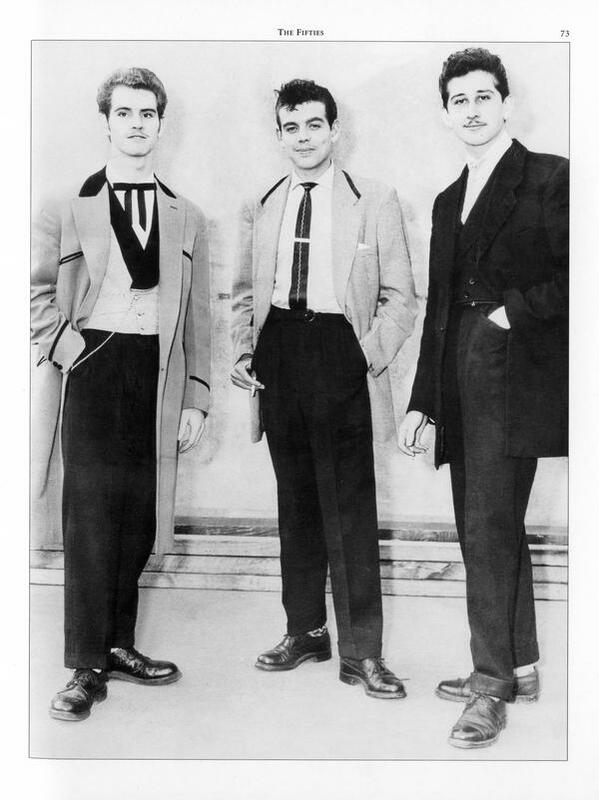 The Teds, as they called themselves, wore long drape jackets, velvet collars, slim ties and began to pair the look with thick rubber-soled creeper shoes and the ‘greaser’ hairstyles of their American rock’n’roll idols. 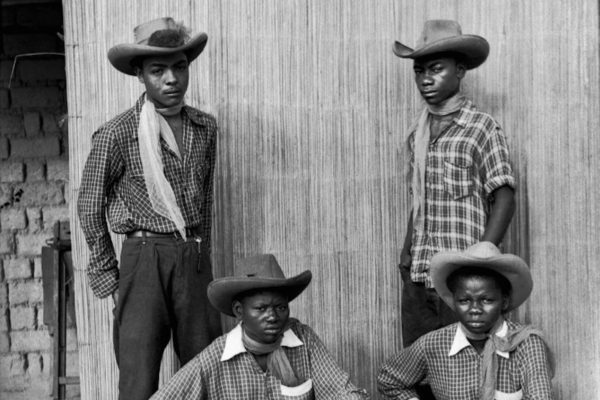 Despite their overall gentlemanly style of dress (certainly compared to today), the Teddys were a teenage youth culture out to shock their parents’ generation, and quickly became associated with trouble by the media. 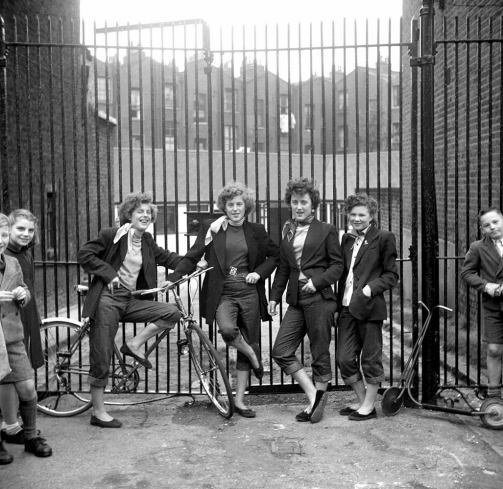 Teddy girls were mostly working class teens as well, but considered less interesting by the media who were more concerned with sensationalizing a violent working class youth culture. 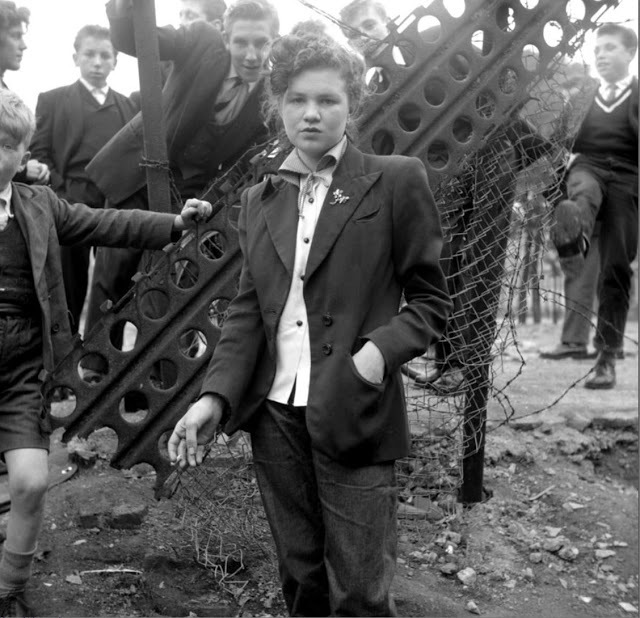 While Teddy boys were known for hanging around on street corners, looking for trouble, a young working class woman’s role at the time was still focused around the home. 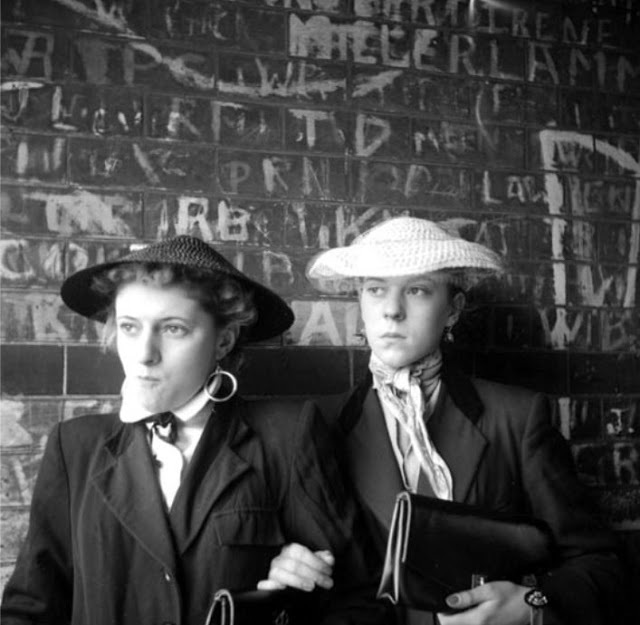 But even with lower wages than the boys, Teddy girls would still dress up in their own drape jackets, rolled-up jeans, flat shoes, tailored jackets with velvet collars and put their feminine spin on the Teddy style with straw boater hats, brooches, espadrilles and elegant clutch bags. They would go to the cinema in groups and attend dances and concerts with the boys, collect rock’n’roll records and magazines. Together, they essentially cultivated the first market for teenage leisure in Britain. 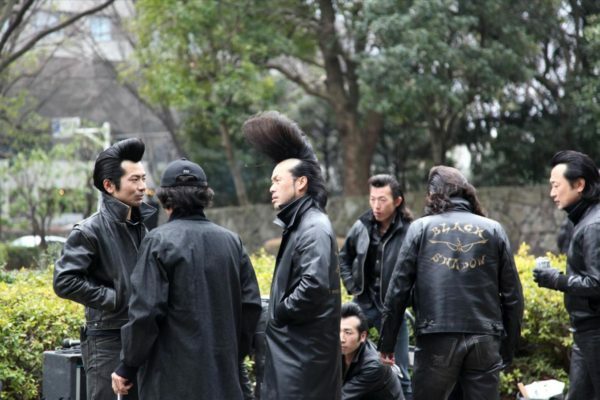 In the end, it was the troublesome reputation of the Teddy Boys that got the better of this youth subculture. Most of the violence and vandalism was exaggerated by the media, but there were notably a few gangs that chose a darker path. 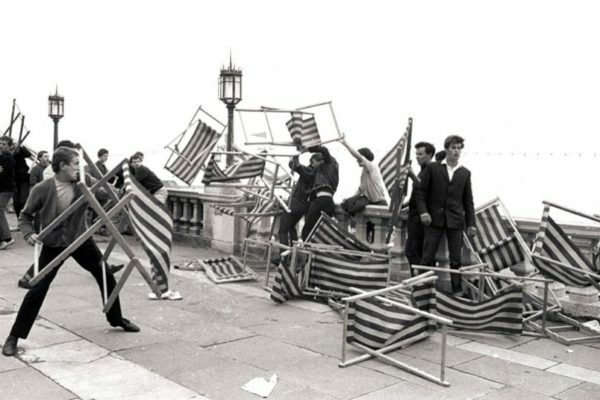 While most dedicated Teddys were at worst involved in petty crimes such as bootlegging, there were instances of fascist gangs rioting and using razors and knives to carry out racist attacks. 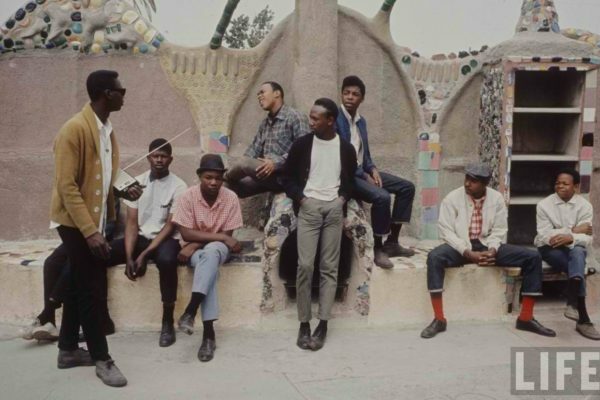 The racist tendencies of the Teddy boy gangs in the end lost to the unstoppable rock’n’roll movement centered around African-American acts. The British pop boom of the 1960s brought new music and new youth cultures. 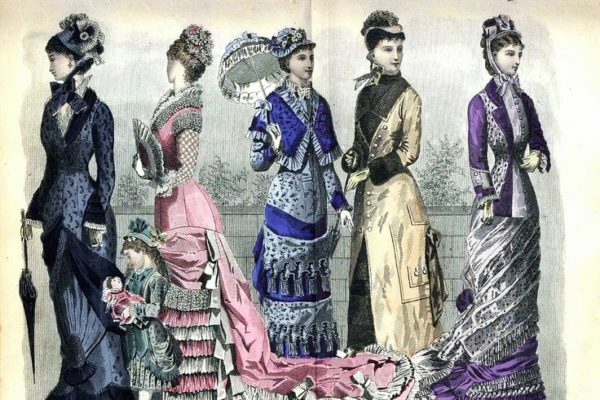 It’s certainly a great shame that such an interesting and elegant style of dress for young people had to be associated with such negativity. 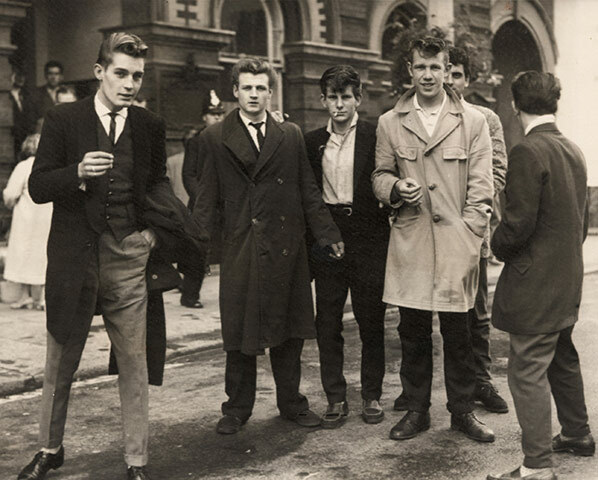 The Teddy Boys were the first group in Britain whose style was self-created. 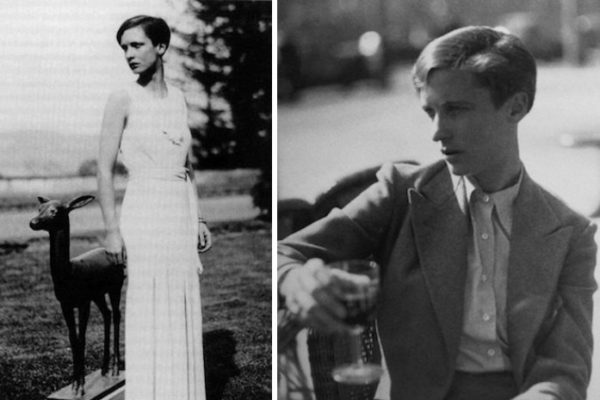 But in the end, it would seem the style only spawned fashion victims. 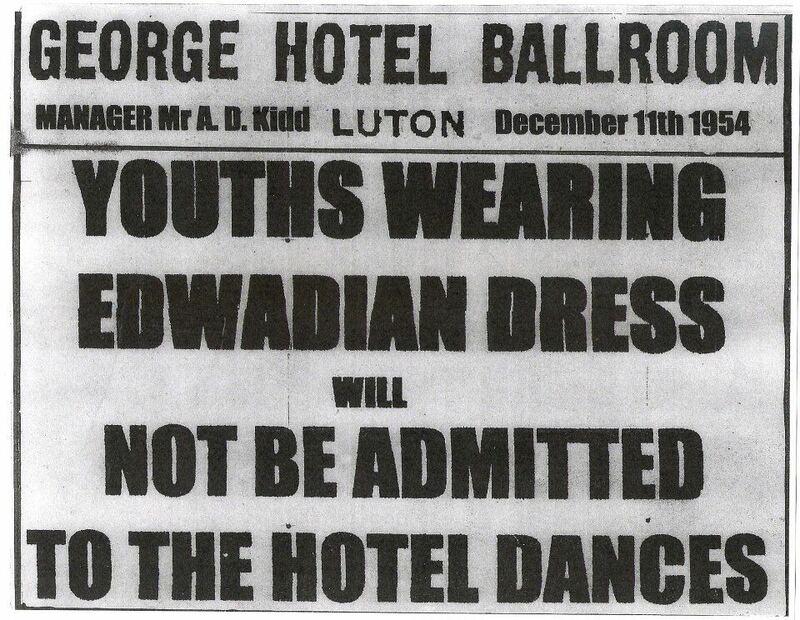 Sources: More about Teddy boy culture via the Edwardian Teddy Boy. 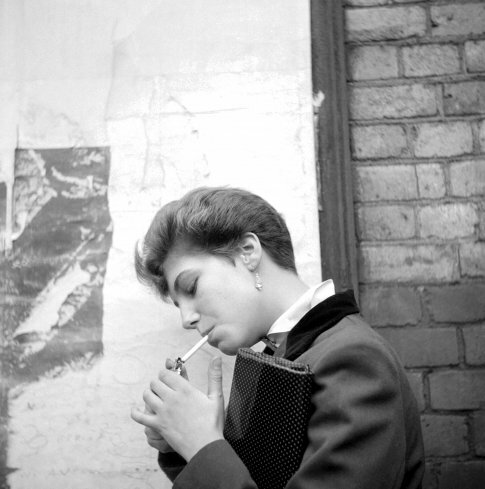 Photographs of Teddy Girls by Ken Russell (1927-2011). All images courtesy of TopFoto.co.uk, all rights reserved please contact accounts@topfoto.co.uk for licensing or exhibition rights.